Aaron had a dental appointment this morning. I looked forward to this being a morning of Aaron being in a compliant, happy mood because he would be looking forward to lunch and maybe a Wal-Mart trip. Instead, I found Aaron down on my computer, looking up cheat codes for a game. I fussed at him and he got off, but came up to my room wanting to know if I would print off some cheat codes for him. He was carrying a large sheaf of stapled-together codes that he said a staff member at Paradigm had printed off for him. It was very large – the number on the last sheet was 77! And Aaron wanted me to print it off again………at least that’s what he said……….and so began the very frustrating process of trying to figure out the why and the what of Aaron’s request. Aaron couldn’t explain to me exactly what it was he wanted me to print, even as I explained to him that I was not printing 77 pages – that he already had! He began to escalate, and then hit my dresser with his fist as he walked out. Thus ensued the fight – not physically, but verbally. I was trying to understand what he wanted and at the same time calm him down, all the while feeling my tiredness and my exasperation mounting. Soon I was yelling……..and Aaron was yelling……..and I yelled louder………and Aaron responded likewise. It was a lose-lose situation all the way around. I backed off and walked away, taking a few minutes to calm down and then approaching Aaron again as he headed toward my room. We came to an agreement……….more of a stalemate……..and soon left for the dentist. Both of us were quiet and rather depleted. And I was feeling very guilty. Aaron waited for me in the van as I put something in the mailbox, picked up the newspaper, and got the empty trash cans ready to roll back to the house. I took a step or two and then saw it……….a weed growing up between a crack in our driveway. What would have been an ugly weed, except for one thing. Growing on that weed were such delicate little violet blooms that I had to stop in my tracks and stare down at it. 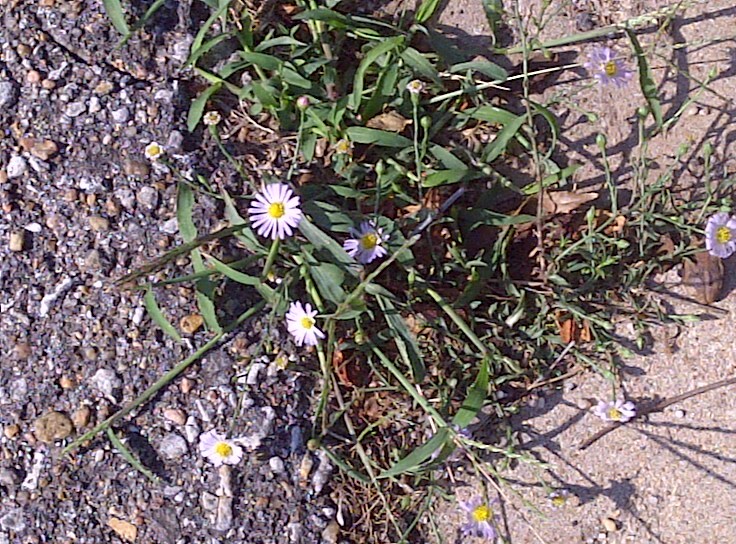 Those little blooms transformed that otherwise annoying weed into a soft spot of beauty on our driveway. Instantly my heart was pricked. My behavior with Aaron not an hour earlier was ugly and hateful. I let my tiredness and my selfishness call the shots instead of letting the Holy Spirit empower me to respond to Aaron with love and kindness. Out of my nasty behavior, I needed something soft and pretty to grow……..something that only Christ could enable to bloom. Forgiveness. In particular, to BE forgiven by Aaron. I’ve read and studied a lot about forgiveness over the past few years. In fact, I just listened to some on-line lessons last week on this very subject. I know quite a bit about the anatomy of extending forgiveness and being forgiven. Could I practice this today? With my child? With Aaron? I chuckled. This is as good as it will get with Aaron in the forgiveness department. Oh, he heard me loud and clear………..and he registered every word that I said. He may still call me weird, as he did earlier…….or maybe not. He knows, though, that I am sorry. He knows that I love him. He knows that I am human……..and weird sometimes. And I know that a little flower began to bloom in my guilt-ridden heart. For I had also asked God to forgive me and He did more than grunt. He has given me assurances all over His Word that He is there, waiting with open arms to forgive………..and to forget! I can’t forget my behavior, but I pray that I will once again learn from my failure and grow in this issue of forgiveness. Grow and bloom………beauty from ashes, God says. Just like my little driveway weed. Previous Previous post: What Type? What Time? Next Next post: Wednesday on a Tuesday? !